An Art Activity Book for Animal Lovers and Artists of All Ages. Lions and tigers and bears oh my! 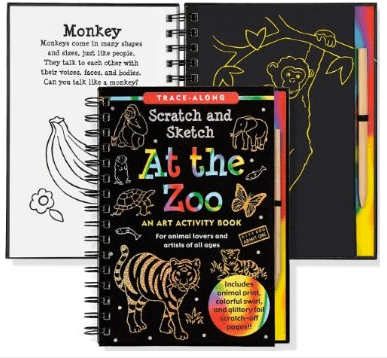 This fun and easy trace along activity book guides young artists with outlines of familiar animals black-coated with scratch art pages. Use the enclosed wooden stylus to reveal bright, gleaming colors beneath. 20 scratch off. 20 illustrated, and 20 sketch pages. Approximate dimensions: 6-3/8" x 8-1/2"